This is an automatic wrapping machine specialized in horizontal shapes such as pipe, sheet, door, floorboard, aluminum profile. The wrapped package is well-protected, sealed and make items tidy. 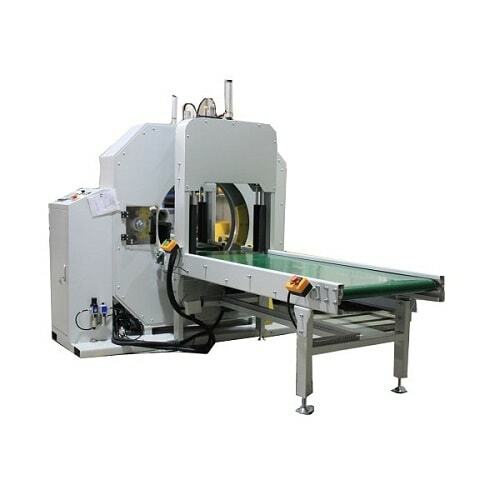 The machine can be connected to the packing line for automatic wrapping. The machine shall be mounted on the flat and hard ground, where the ground load should be more than 1 ton/m2. Conveyors drive by motor with gearbox. PLC and program make the machine able to do automatic wrapping according to your packing goal. Photocell sensor is adapted for setting packing position. It is forholding the package avoid shaking in wrapping. Wrapping effect： Product surfaceis smooth and even. The electrical devices are installed on mounting plates in closed cabinets, protection degree IP20, designed in form 1 based on EN 60439-1. Each cabinet has a designation label on the door with the appropriate location indicator. The switching cabinets are installed in a switching cabinet row. For transport the cabinet system can be separated into shipping units with a maximum width of 3600 mm. Lighting for the switchgear is provided by a lamp combination with a 230V outlet built into every other switching cabinet. The used components are protected against accidental contact. Additional endanger components under voltage are covered with transparent covers and warning labels in all transformers, fuses, breakers and copper tracks, etc. The wiring is flexible for all control circuits and lies in covered cable conduits. Attention is given that these cable conduits are filled only up to 70% with wires. The wire color codes and diameters conform to EN 60204. The terminal strips are mounted approximately 250 mm from the lower edge of the switching cabinets. The terminal strips have labels showing their respective terminal strip number. Each individual terminal is given a terminal number corresponding to the wiring diagram. Cable stop bars are installed to prevent excessive tension on the outgoing cables. Each device in the switching cabinet is provided with an adhesive label indicating the designation of the module in the wiring diagram. Identification of the individual wires is necessary for the internal wiring in the switching cabinets. The identification of the incoming and outgoing cables and lines is designed in such a way that they can always be read without detaching the connections or removing the cable stop clamps. The individual wires of a cable can be identified by the terminal number of the connection point. The cable can be identified by its cable number. The complete plant will be controlled through manual input on dedicate remote/local control desk and foot switch. The machine cabling conforms to effective regulations. The cables are laid in conduits in the concrete foundation of the line. When exposed and in hazardous positions, the cables are placed in hoses in the top of the concrete. The existing termination switches, magnetic valves are connected directly to the bus modules installed in the terminal boxes/substations. Direct cabling is between the individual motors and the wiring cabinets. Regulated drives with frequency inverter with shielded cables. Under the Guarantee of the Supplier, the line will be supplied in full conformity with the Chinese safety rule regulation. Complete safety guards for the area and CE declaration forms will be supplied by the Customer according to the local laws. The Seller has to provide all necessary material (a part the listed in the exclusion list if any) in order to fulfill the performances and all needs. The Seller will supply the Supervision service as per necessary time and presence with a minimum number of days. The Seller has to provide at least 1 month in advance of the foreseen starting installation date a list of necessary stuff for installation specifying the type, load, and schedule of using time. The Seller has to provide at least 1 month in advance of the foreseen starting installation date a complete instruction report with eventual adjustment, special arrangement and guideline for machinery transportation inside building and charge on foundation plant. According to the Seller experience below the foreseen main power days for erection, commissioning and start-up provided by Buyer. 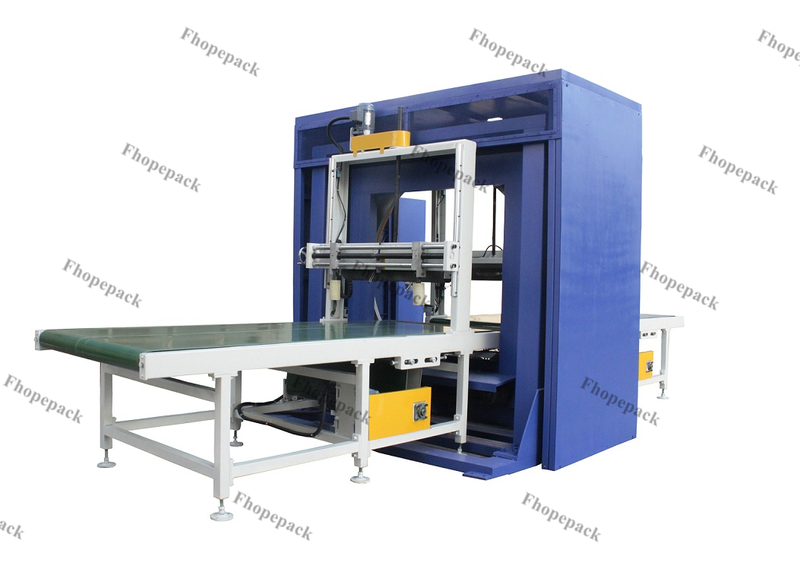 Professional factory for a horizontal wrapping machine with yellow jacket type film packing for long shape package.